A 69-year-old man was arrested in Thermal, California, for possessing hundreds of pounds of lemons allegedly stolen from a nearby farm, a sheriff's sergeant said Saturday. 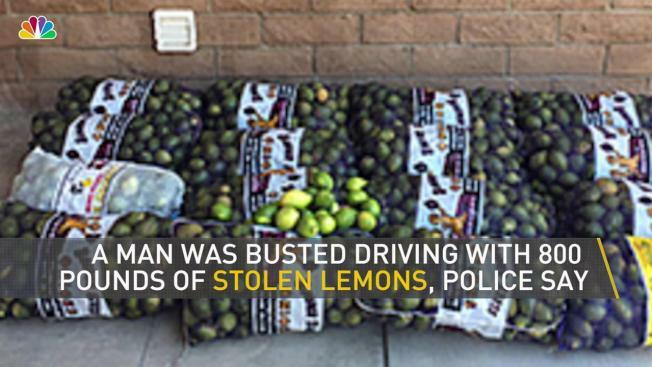 Dionicio Fierros of Los Angeles was pulled over at 9:45 a.m. Friday at the intersection of Grapefruit Boulevard and Pierce Street and was arrested when deputies found 800 pounds of freshly picked lemons in his vehicle that sheriff's officials said were stolen. The arrest was part of a larger ongoing investigation into agriculture theft in the Coachella Valley, Riverside Country Sheriff's Sgt. Chris Frederick said. Fierros was booked into the Indio Jail and was released after posting $10,000 bail.